in the old Batman TV Show style! Hopefully this means that he’s learned to use eyeliner to throw a nasty spitball. He might have a chance then. Most closers don’t know the first thing about complementing their natural skin tones. If you look at the quotes from the press conference, Bavasi and Hargrove were both pretty forthcoming with their shots at Rafael Soriano. You can feel the frustration with Soriano coming off those comments. It’s no secret the M’s were annoyed with his hit or miss availability last year, and that frustration was one of the reasons we all knew that Soriano was their main piece of trade bait this winter. Just like with Carlos Guillen, the Mariners felt that Soriano wasn’t reliable because they couldn’t count on him to answer the bell every time they called. They traded Soriano, and believe that Reitsma is an upgrade (just a mind boggling comment), due to their evaluation of Soriano’s toughness. Reitsma is a gamer, an off-the-charts makeup guy who will always pitch when the phone rings, while Soriano is a guy who nurses his injuries and isn’t always there for them when they need him to be. It’s B.S. They are, once again, valuing personality over talent, and letting their frustrations get in the way of evaluative decisions. They all deserve to be fired. Every last one of them. Wearing makeup is a good strategy to have. I’d be pretty distracted if some guy wearing eyeliner and lipstick was pitching to me. Why do you guys want him to fail so bad? Don’t you know that makes his mascara run? 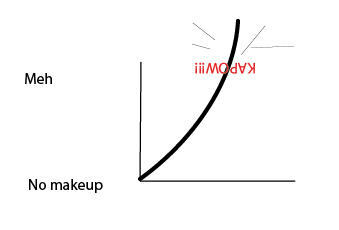 Wearing makeup is a good strategy to have. Iâ€™d be pretty distracted if some guy wearing eyeliner and lipstick was pitching to me. Dude, you need to get a girlfriend. The WFB strategy strikes again. Itâ€™s B.S. They are, once again, valuing personality over talent, and letting their frustrations get in the way of evaluative decisions. In my fantasy league (AL-only and 6×6 where holds count) Soriano was the first non-closer bullpen guy taken in 2006, and he was a fairly hot commodity in 2005. Now, mind you, his value in fantasy leagues isn’t sabermetric (low ERA, nice K/9, and holds), but if a bunch of middle-aged guys dropping beer money on a fairly competitive roto league see him as valuable, why can’t the M’s FO? It makes me wonder if the M’s want their pitchers to “tough it out.” Maybe that’s the secret as to why the M’s have so much trouble with pitching injuries. Hmm, maybe I was too kind to Snelling. Perhaps he’s a 1/2-Tool player. Some fans could’ve taken to his Aussie accent so there’s Fan-Friendly potential. Otherwise he’s clearly worthless to the organization. Soriano is still pitching because he took care of himself and did not let Hargrove/Bavasi destroy him as they did Madritsch and Lowe. Hargrove ruined both of them in non-win, non-critical situations. He should be drug behind horses, let alone fired. Preface: Soriano is a stud with great K/9 and K:BB and the trade to ATL sucked. With that said, why is this a bad move? When both players are healthy Reitsma has better FIP, and xFIP numbers. While his K’s aren’t as high as Soriano’s his K:BB is about the same and he also tips to the groundball side of things, which favors this defense. As for Bavasi’s statements, its a PR event. That is what they are supposed to say. Try and see the forest thru the trees folks. I guess it’s time to drag this out again. I don’t even want to know how it was noticed that he qualifies for the first tool. I suppose we can just trust Hargrove’s knowledge for once. With that said, why is this a bad move? Now, on top of that, if someone thinks that Soriano is a better pitcher than Reitsma, it seems completely reasonable that Bavasi’s comments spinning Reitsma as better than Soriano would make him even more frustrated with the situation. I don’t get the bashing of Reitsma. His pre-2006 numbers were good, he should be healthy by ST, and there were plenty of other teams after his services. We should be happy he decided to come to Seattle. I haven’t been pleased with the job Bavasi and Hargrove have done. They’ve made some head-scratching moves this offseason. But this isn’t one of them. Clearly what Bill means here is this: Start with any closer X, whose makeup is given by the function M(X), and Reitsma is represented by R so that X=R when the closer is Reitsma. Having chosen closer X, there always exists a value of Y in the interval (X,R) such that M(Y)>M(X). Thus, as our choice of closer approaches Reitsma, his makeup increases without bound. re: 10 What about playoff experience? Six tools? Shoot, I forgot about Playoff Experience! But since WFB lacks that skill yet he must remain a 5-tool player, let’s have Playoff Experience be interchangeable with Veteran-nicity. Sound good? Truly can not imagine they would imply anything that questions Soriano integrity. There are so many thoughts firing in my pea brain that where to start. First the willingnes to even pitch after being beaned by Vlad deserves a standing ovation in my world. I had no idea that Soriano was reluctant to pitch. Judging by the Ms ability in the past to diagnose correctly medical problems, it would seem prudent to trust ones own feeling. Have no problem knowing Hargrove took parting shots at RAFFY but thought Bavasi was a bit better than that. I think the curve needs some lovely long lashes to indicate just how outstanding that make-up is. Don’t be surprised if the Mariners actually do have a chart like the one above. The Mariners’ scouting philosophy: Charts R Kewl. Of course, these are the same people who thought Crazy Carl was the best DH available. So did we really expect anything different? It might have something to do with 26 blown saves since ’03, the fact he doesn’t miss many bats, and the fact he’s a complete downgrade from Soriano. #13—In fairness, it was Melvin who ruined Madritsch in a lost cause, not Hargrove. There’s plenty of other evidence to support firing Grover (not to mention “every last one of them”)—we don’t need to make things up. BTW, does anybody know who got dropped from the 40 man to make room for Reitsma? #30 slip, not a makeup, Melvin did that to him so that 100 losses would not have been reached. Hargrove would have done the same. What is important about him and Lowe is that the rest of the team sees how they were screwed as does the rest of the league. Considering the deals other relievers got this year, Reitsma is a steal. Keith Friggin’ Foulke just got 5 million. I’m sorry, but he’s done. Complain about Hargrove for the things he’s bad at, not imaginary transgressions. God knows we have enough real problems. â€œWhen we moved Soriano, we did take a bite out of the back part of our game. This, we think, fills it and maybe even a little beyond that.â€ Ummm…Bill? Are you feeling ok? How does Reitsma match or exceed Soriano? â€œChris is a kid who wants to pitch every day,â€ Mariners manager Mike Hargrove said. That’s good. He’ll probably have the opportunity to pitch every day too. â€œComparing the two, on the right night, Rafael might have had more power, but [Reitsma] is more consistent in what heâ€™s bringing, whether itâ€™s velocity, command, breaking stuff,â€ Bavasi said. â€œHeâ€™s probably a little more consistent. Rafaelâ€™s a great talent. But he is the right guy. His makeup is off the charts.â€ Make up your mind, Bill. Reitsma IS more consistent, or Reitsma is PROBABLY A LITTLE more consistent? Consistent with what? Oh…and what little I remember of my old statistics classes, it’s very easy to make a chart look like anything. Sigh. The Reitsma acquisition: meh. Reading Mariner FO quotes: priceless. It gets harder and harder to believe how insane all this is. That not only are Bavasi’s ideas bad, every word he says in interviews shows how out of touch he is. How can a job like that be given approval (or how can it not be recognized) by Lincoln/Nintendo? How is the obvious and instant reaction not to try for someone with a more innovative approach? Here’s an idea for a feature: a collection of Bavasi/Hargrove quotes that give assessments of players (the quotes posted by Dave at the beginning of this thread are perfect examples) with accompanying commentary. Bavasi’s strategies are blunders, and his comments on them prove his incompetence. It seems like with how long he’s been around a pretty thorough outline of his bad habits of thought could be assembled from his quotes. 34 You expose the gap between reading about baseball and reality. Whether its a 35 pitch inning or a 140 pitch game or night after night of pitching as in Lowe’s case over a short period overuse is a critical component to pitching injuries. Probably in front of bad mechanics. Read up on Mike Marshall or Tom House. Get informed. You wanna know whatâ€™s gritty? Having an extra muscle in your elbow that grinds against your nerves and make your hand go numb. Only one person other than Reitsma is known to have had such a muscle. And that manâ€™s name is . . . *drum roll* . . . Kenny Rogers. And thatâ€™s Kenny Rogers the singer, not the pitcher. Seriously.